Row by Row ON THE GO! Well, summer is here and that means most of you will be “On The Go”. 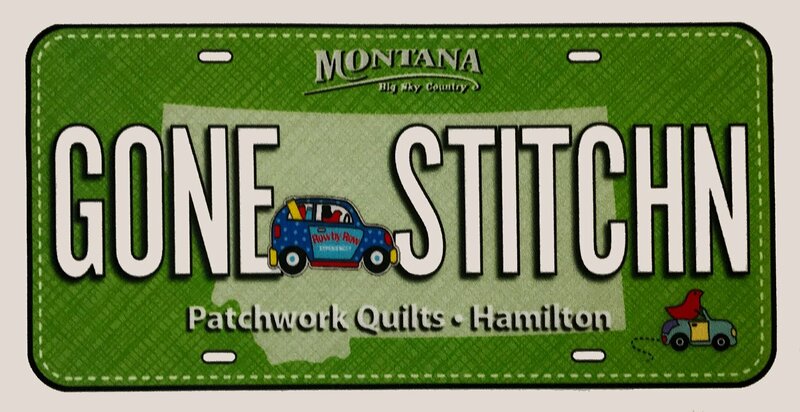 You’ll be going Campin’and Fishin’ in the mountains, or to your quilting/sewing studio for some Stitchin’. And hopefully, most of you will also be spending a great deal of time (and money) going Shoppin’ at Patchwork Quilts. I think that is FANTASTIC! Because that’s exactly what this year’s Row by Row theme is all about – “On The Go”. And the row that I designed for Patchwork Quilts enables everyone to know exactly where you are going. Having fun is important at Patchwork Quilts, so we decided to have a little fun with our vertical row (named “Long Gone”) by adding exchangeable signs to say where we are. 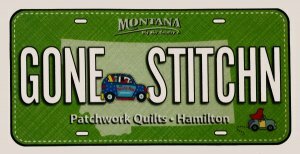 Camping, stitching, fishing, and of course shopping at Patchwork Quilts are popular pastimes in our lovely Bitterroot Valley. To let people know where you are, simply take the appropriate sign and place it on your door. How fun!! Our Row by Row Kits are $19.95 and an embroidered sign accessory pack is also available for $5.00. Our License Plates are $5.00. Stop in and get your kit today. Once it’s finished, you can practice by placing the Gone Shoppin’ sign on your door and heading on down to Patches to shop. By the way, the directions will instruct you to repeat this same process every day for a month before switching to a different sign (we want to make sure you do it correctly). Free Patterns can be handed out starting on June 21st. Only 1 per person. You must pick the pattern up at our shop; they can’t be mailed. Customers travel, collect and shop from June 21 through September 5th. Customers bring in completed quilt for prize from June 21st through October 31st. The first customer who brings in a completed (quilted, bound, labeled) row quilt using patterns from AT LEAST 8 different 2017 participating shops, will be awarded a bundle of fat quarters. If the finished quilt ALSO includes our (Patchwork Quilts) Row, we will award you an additional Bonus Prize. During the "Hibernation Period" (September 6th through October 31st), NO patterns or kits may be sold or handed out in any way. The game is over on November 1st. Row Patterns and Kits may be sold after this time however we wish, without restrictions (i.e., in person, website, phone orders, etc. ).